We spent over 30 hours researching and testing over 15 different kinds of mops and found that performance, ease of use, and construction quality were most important to consumers who were shopping for kitchen mops. The O-Cedar EasyWring Microfiber Spin Mop scored high marks in all categories and is our overall top pick. O Cedar’s EasyWring mop provides effective and efficient cleaning with little mess and hassle. The triangle mop head makes cleaning difficult-to-reach areas much easier. The spin bucket that comes with this mop allows you to decide how much water is used on the floor so your floors dry quicker and the whole mopping process is easier. Mops are a very easy way to keep your floors sparkling and clean whether it is in your home or in a school or office hallway. They are crucial for keeping hardwood floors looking great as well. With so many different mops on the market it can be a real challenge to choose one that will meet your cleaning needs and personal preferences. Some people dislike mopping due to the fact that it can be messy and cumbersome, but you don’t want to avoid mopping for too long or you will end up with dirty floors that make the whole room look bad. We have provided you with a few tools that will help you narrow down the search for the right mop for your floors. The reviews below feature the three top-rated kitchen mops on the market that are very popular with consumers. Take a look at the reviews and see if any one of them will work for your mopping needs. We also have included a buying guide that will provide information on the features to look for, how to determine your mopping needs and much more information that will make kitchen mopping a breeze. The O-Cedar Easy Wring Spin Mop is a best-selling mop by a well-known company that is known for mopping and housecleaning products and supplies. This convenient twist mop comes with a sturdy bucket that features a built-in wringer that is hands-free and easy to use. Control the wringer with the convenient foot pedal that allows you to keep your hands dry and out of dirty water. The microfiber mop head works well for wet and dry use. You’ll be able to clean corners easily thanks to the unique triangular-shaped mop head that is safe for all types of floors including hardwood flooring. 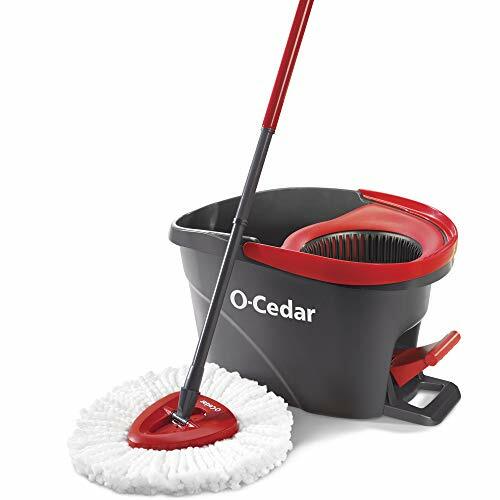 One of the great features of this O-Cedar mop is that the mop head can be thrown in the washer to be cleaned so you can use it repeatedly, knowing it’s been truly cleaned. Every 3-6 months you can replace the head with one of the refills that are available. The wringer bucket that comes with this mop features a splash-guard to prevent accidental messes. The telescopic handle can be adjusted to 51” to make it comfortable for people of different heights. Get your home clean superfast with the stainless steel rolling spin mop from Mopnado. This mop system is the perfect one for all kinds of floors including concrete, vinyl, stone, hardwood, tile, and laminate too. The washable and durable mop heads can be tossed into the machine and washed which means they will save you the time and money you would spend replacing your mop all the time. The head of this sturdy mop can swivel 180 degrees so you can easily reach underneath furniture. The long handle can extend to 56”, making it easy to reach ceiling fans and windows. Rinsing the mop head is much easier than other mops thanks to the unique spin dry basket that is made of stainless steel. The stainless steel handle is super strong and comes with a 1 year warranty. You will get 2 microfiber mop heads, cleaning solution dispenser, and scrub brush attachment with this great mop so you can get your floors sparkling. 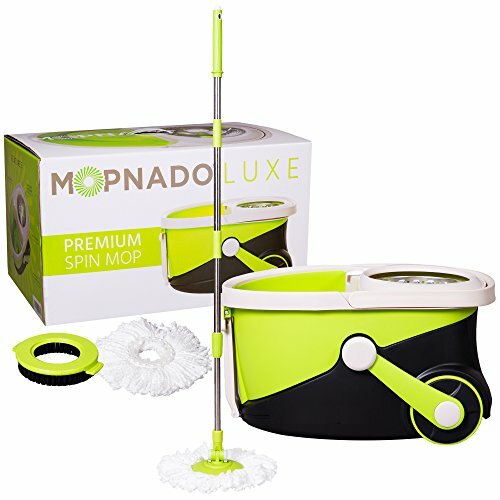 If you are looking for a long lasting mop that will get the job done without tons of work and struggle, get the Mopnado spin mop. This professional quality mop is perfect for cleaning the floors in your home or at the office. Whether they are tile, laminate, hardwood, stone, or concrete, you will be able to use this mop safely. This microfiber mop is much more effective at cleaning than regular cotton mops. Cleaning your floors will be much easier thanks to this professional grade mop. You can use it for wet or dry cleaning and will help you leave your floors sparkling with ease. Included with the mop itself is a 6 foot mop handle made of stainless steel, a durable mop frame, 2 wet mop pads made of microfiber, and a microfiber dust mop pad. The three top-rated kitchen mops featured above are all high quality products from reputable companies that make it a business goal to produce quality. All three selections will help you get your floors super clean with minimal fuss and mess. Each selection has convenient features that allow you to get your floors super clean without having to get your hands in dirty water. Taking the time to learn about the different kinds of mops on the market so you can choose the right one allows you to get your floors clean the way you want. Dirty floors will make your whole house look dirty even if they are swept. Once you are ready to purchase a kitchen mop, choosing one of the top rated selections we have featured above is a great place to start. If none of these appeal to you, we have added a few others for your consideration as well. There are several different kinds of kitchen mops on the market that will do a great job on your floors. We have listed the different types of mops below along with some information about each of them. Cut End – This basic mop style is the most inexpensive of all the types. They are usually considered to be disposable because they are so inexpensive and cannot be washed the way some of the other types can. Cut end mops are a little more absorbent than the looped end varieties but they don’t cover much surface area. They are very good for soaking up spills. Looped End – Looped end mops will cover much more surface area than cut end; a major reason looped end mops are used in schools and offices to keep those floors clean. They are durable and not too expensive. One of the great things about looped end mops is that they can be washed in the washing machine unless they are made from poly-cotton blends or cotton. Microfiber – Microfiber mops are made from polymide and polyester blend that traps and collects dirt until you wash it. This type of mop is the most sanitary of all the mops. Microfiber mops can absorb as much as 7 times its weight in water or other liquids. You’ll be able to wash a microfiber mop head over 500 times without the mop head falling apart. These mops are non-abrasive and hypoallergenic. They are also eco-friendly and requires less chemicals that other types of mops. There are many different kinds of mops on the market to choose from. For this guide we are focusing on kitchen mops. We’ve listed the most common types of mops below. 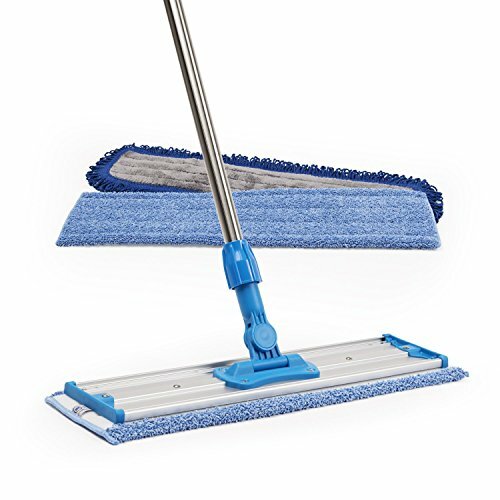 Flat – This common type of mop has a flat head that you can affix cleaning pads to. The cleaning pads are usually disposable but there are some that you can wash and reuse. These flat mops are great for everyday cleaning jobs and are very easy to set up and use. While they are great for general, easy cleaning if the floors are particularly messy these may not be your best choice. If you don’t want to get another type of mop for stains or stuck-in food, pre-treat the areas before mopping. String – Cotton string mops are very absorbent and also offer scrubbing power when needed. These mops can get into corners easily but they are not as popular do to the hassle and frustration that wringing them out can be. String mops usually fall apart fairly easy and can be a challenge to wash and dry. Cotton string mops are very inexpensive. Strip – Strip mops have long handles and are usually used for cleaning fans and corners. String mops are easy to take care. Strip mops have more ability to scrub spots that need it. You will need to replace the top when it wears out but since strip mop heads dry quickly, this prevents them from getting disgusting too quickly. .
Sizes – Consider the jobs you want the mop to do most often and the size of the wringer. Mops are typically sized by ounces. The higher the ounces are the larger the mop head will usually be. If you plan on using the mop for a lot of large jobs, you will have better results getting a larger mop. Yarn Ply – yarn ply refers to the number of fibers that are twisted together to make a strand of the mop. The more plies a mop has the stronger it is. Keep in mind that lots of plies doesn’t always mean high quality fabric. More strands being added can increase durability but it usually lowers the absorbency. It is better to find a high quality yarn and have less of it than to have a lot of low quality yarn. Anti-Microbial – Some mops are made with antimicrobial additives added to the yarn that makes up the mop head. This will protect the mop head from mold, bacteria, mildew and yeast. Absorbency – The size of the mop’s head has more to do with absorbency that then material it is made from. Small mop heads can usually hold about 8-10 ounces of water and liquid; Medium sized mop heads can hold roughly 16 to 20 ounces of liquids, Large will usually hold anywhere from 24 to 32 ounces and extra-large 32 ounces or more. Absorbency is important when using a mop because if the fibers aren’t absorbent all you will do is push the water around. Headbands – There are two different sizes of headbands on a mop: wide and narrow. Narrow bands typically measure 6 ¼” long and are mostly paired up with stirrup style handles. These are good for finishing mops. Wide headbands are 5” wide and 6 ¼” long. Some of the head bands that keep the mop head together and attached to the mop handle will have mesh bands that offer a scrubbing surface for stubborn floor areas and will also help the mop dry quicker so mildew and mold do not grow. Kitchen mops are used on a regular basis to help keep your home clean. Some people like to mop their floors every day. Whatever your cleaning schedule is for your home, you can’t do a good job getting your floors clean without a good quality, absorbent, durable kitchen mop. The three top-rated kitchen mops we have featured above are good examples of high quality kitchen mops that will help get your floors clean. All three of these selections offer you a way to keep your floors sparkling without having to get your hands into dirty mop water to wring out the mop by hand. Any one of them would make an excellent kitchen mop for your needs. If your home has hardwood floors throughout, you can use one of the top rated choices above to mop your entire home and it will do an excellent job. The information in this guide will help guide you on the right kitchen mop for your needs. If one of the top rated mops reviewed in this guide don’t appeal to you, use the information we have provided on the features to look for and other information we have included to sort through the many choices. Make sure to determine your needs first so you know what kind of mops to look for that will fit those needs and preferences.